First of all, to everyone who has been affected by Hurricane Sandy—our commiserations to you, and hope things return to normal soon. So that’s Halloween been and gone, and no trick-or-treaters made it as far as the front door (remember folks, an alligator pit really does pay for itself). Now, as I’ve mentioned before, I’m slowly losing my sight—again— everything’s out of focus, I struggle to read print, and driving is becoming more exciting than my passengers and other road users would prefer. It’s really not serious, though: the condition’s called posterior capsule opacification, and a simple laser zap can fix it. I can still see well enough to knit, for the time being at least. 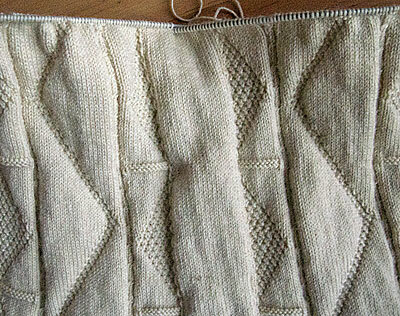 I’m just coming to the end of the third diamond and the whole thing measures just under 14 inches so far. Another diamond would take it over 18 inches, which would be too long, so I’m going to resort to my fall-back position—tune in next week for details. A couple of additions to the gallery for your interest this week. Judit has sent me this fun idea for using up leftover gansey wool, which is not only practical but also unbelievably cute. 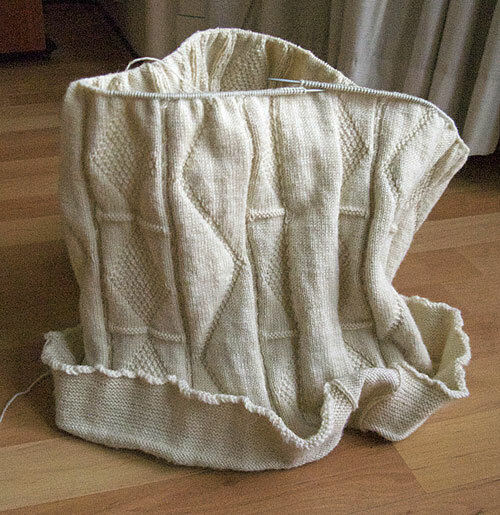 And David has sent me this picture of a gansey he machine-knit using one of my favourite patterns, Mrs Laidlaw’s from Seahouses. 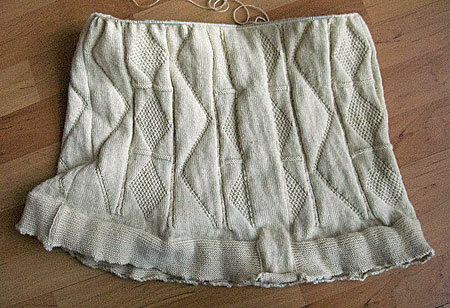 I’ve never tried machine knitting—I steer clear of all machinery after my Dad told me about the time in New Zealand when a man came into the shop with his fingers in a dripping handkerchief after an accident with a bacon slicer—but if they can produce results like this, I’m willing to be converted. Thanks to David and Judit for sharing these. Also in parish notices, the Dover reprint of Michael Pearson’s Traditional Knitting is now out in the UK. Takes a few weeks to arrive, but as this is one of the books about ganseys I regard as essential, I urge you to place your order. It would be rude not to. Oh god ya, the eye exam. I almost want to lie and say I can’t read a thing, but I might lie in the wrong direction – near or far. Here’s my question – by waiting for the laser, are you potentially causing more damage. I’m with you, as I have cataracts – far less staggering, but I’m still waiting to “ripen” for the surgery, like you. Man, you sure make progress. You’re good. 14″ is speedy for just a few weeks at your needle size. And, it’s looking pretty spiff. Nice color for the pattern – really creates more readable shadow and light. Thank you for your best wishes after Hurricane Sandy. It was a doozy. Not too bad in Eastern New England, but New York and New Jersey were bombed. 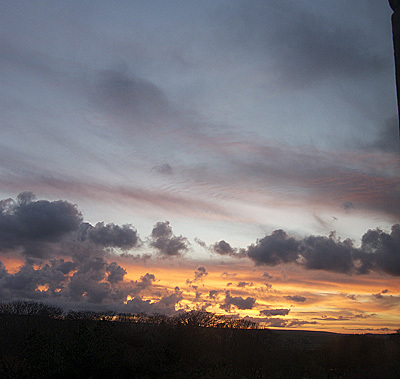 Gordon, your photo – is it a glorious sunrise? Halloween – we had 20 kids! Last year, 4. No lights, just woods, no sidewalks. Brave kiddies. How’s the good ole’ neck? The neck is back to normal, thanks for asking. The eyes not so good. I had cataract surgery about 3 years ago, which was OK. But I’ve since developed the “secondary cataracts”, the film that grows over the artificial lenses they implant. It’s a little complicated in my case, because my eyes are (a) unusual, and (b) very delicate, so I’m keeping my fingers crossed. I just hope they can clear it before both eyes go! Margaret’s the photographer—I’ll have to check with her. The picture is either a sunrise or a sunset. Or a fire in one of the offshore oil rigs. My 1980s copy of the previous is getting a bit tatty now, but it’s still my go-to book for gansey inspiration. The photos are good, the drawings are excellent, and the writing draws you in. I think I’d still read it for pleasure if I’d never knit a gansey in my life! I hope you find it’s worth it. I have Michael Pearson’s new book on order and it was a real bargain on Amazon.com for $10.68 + $4 for shipping. I’ll have it just in time to start my winter gansey knitting – it will line up just fine with my half-dozen other gansey reference books! Gordon, I think you need to get on a wait-list for head/neck transplants. Judit—now I really hope it’s worth it! Just ordered the Michael Pearson book, not available in the US until Jan 16, 2013, and a special offer for another book on casting on and binding off brought the total to $22. Thanks for the notice on this. Hope they deliver it to your address .